Marvel and Sony surprised everyone this morning, launching the first Spider-Man: Far from Home trailer. While it doesn't necessarily clear up any confusion about what happened to Peter Parker at the end of Infinity War, it does give us our first look at Mysterio, and this once and future villain appears to be quite the hero. At least at first glance. There seems to be some confusion amongst fans as to where in the MCU timeline Spider-Man: Far From Home takes place. Kevin Feige seemingly confirmed that it takes place shortly after the events in Avengers: Endgame. But some believe that this all happens before Avengers: Infinity War, and that the bus ride we see Peter taking at the beginning of that movie is Parker and his friends arriving home from their trip aboard. None of this has been confirmed. Spider-Man: Far From Home tells the next chapter in the Spider-Man: Homecoming series! Sony doesn't acknowledge Peter Parker's part in the Avengers saga at all. Here, our friendly neighborhood Super Hero decides to join his best friends Ned, MJ, and the rest of the gang on a European vacation. However, Peter's plan to leave super heroics behind for a few weeks are quickly scrapped when he begrudgingly agrees to help Nick Fury uncover the mystery of several elemental creature attacks, creating havoc across the continent! There had been some debate on whether or not Mysterio will be wearing his fishbowl helmet, as Jake Gyllenhaal had been seen on set mostly without it. While we're introduced to Mysterio here sans the helmet, it shows up when the once and future super villain goes to fight one of the giant aquatic baddies, saving Spider-Man in the process. In the Marvel comics, Mysterio is known as a master of illusion, and Mysterio may be trying to keep Peter Parker away from his elemental creations as to not break the illusion that they are real. Mysterio has always been positioned as one of Parker's deadliest foes. He is a gifted but under-appreciated special effects artist who has a knack for creating tools that counter act against Spidey's own powers. Mysterio hasn't been named just yet, but it is believed that his is the Quentin Beck version, who has eluded death a number of times. Not a lot is unveiled about the character, or his motivation in Spider-Man: Far From Home. And there is still a big Infinity War question looming over everything. Tom Holland returns to play Peter Parker in the sequel, which will swing into theaters this July. 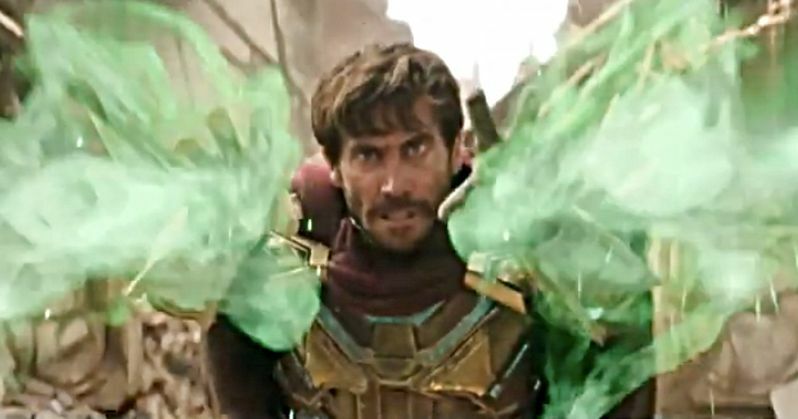 You can take a look at Mysterio in the trailer again, along with some screen grabs of the heroic villain in action, direct from Sony Pictures and Marvel.